What is a Special Governmental Interest (SGI) or “Emergency COA”? The FAA is giving Standard Certificates of Authorization (COAs) to public safety departments limiting the waiver portions to their area of responsibility. 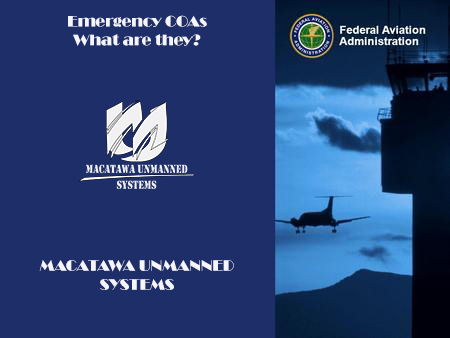 This often frustrates many departments because they usually want authorization to conduct sUAS mutual aid in support of their other mutual aid agreements. The frustration lies in only receiving a maximum of a county COA approval and not an entire FEMA region. The process of gaining more approvals for each additional air traffic control center adds to the amount of time that the COA is in the approval system. Therefore they have stopped pushing regional COAs through and will reject most requests for more than a department’s jurisdictional area. So how does a department help in a mutual support scenario without their COA authorization including operational space within their regional support area? A process called Special Governmental Interest (SGI) which was formally known as an Emergency COA is the method for public and civil operators wishing to support in emergencies. Be operating under an existing COA, which could be a standard or a blanket one. Those working under Part 107 may also apply. The operational need must be sooner than it would take to get a routine waiver as determined by the FAA. The operation MUST support an active homeland security, law enforcement, or emergency operations effort, or in a response, relief, or recovery activity. The department MUST provide sufficient justification to show that the standard process will not work for the operation and the mission is within 14 days or less. Upon receiving the request, the FAA then conducts a review of the proposed action and if there are any updates needed to the department’s current COA. The FAA will also contact the closest ATC Facility to ensure operations are acceptable to the risks with minimum impact to the ATC operations. If approved the department will receive a COA addendum with other measures that could include coordination with the ATC, NOTAM issuance etc.